If you are new to owning or maintaining your own aquarium, it makes sense to purchase products that are easy to use and made by well-known companies. The EHEIM Ecco Pro is one of the easiest to use and most energy-efficient vertical canister filters on the market today, and one that is known for reliability above all else. Because your fish tank filter is going to be operating 24 hours a day, having one that uses as little energy as possible is important. However, you do not want to skimp on performance in order to save a little money on your power bill. Instead, these filters combine large capacity and flow rate, quiet operation, and extremely low energy consumption in a reliable and easy to use product. 4 What Does the EHEIM Ecco Pro Provide? 7 Are There Any Drawbacks? 8 Where Can You Buy This Product? 9 Is This the Best Filter For Your Aquarium? The Ecco Pro 120 is ideal for aquariums between 60 to 130 litres (35 Gallons). The Ecco Pro 200 is for 100 to 200 litres (50 Gallons) and the largest the Ecco Pro 300 is suitable for 160 to 300 litres (80 Gallons). Only 5 Watt power consumption at a pump output of 600 litres per hour and 8 Watt at 750 litres (198 gal/h). Ecco pro is one of the most energy efficient filters on the market. Compared to similar filters at 15 or 20 Watt it uses 44% to 75% less energy. This filter is currently ranked just under four stars on Amazon. It measures 6” x 8.1” x 14” and weighs approximately 6.5 pounds. It includes everything that you will need to get started, including the filter, to shut off taps, piping and tubing, various installation accessories, baskets and all required media. Installation instructions are included and there are also additional installation videos available online. The entire component is made in Germany. This canister filter is designed for aquariums up to 60 gallons and comes with a three year guarantee. It has a flow rate of approximately 150 gallons per hour and operates on 5 watts. The three stage filtration system combines biological, chemical, and mechanical media to provide your aquarium with the cleanest and healthiest water possible. What Does the EHEIM Ecco Pro Provide? The EHEIM Ecco Pro external canister filter is extremely easy to use, but perhaps more importantly, to install. Because it comes with everything that you will need for installation, you will be able to get this up and running much quicker than comparable external canister filters. Ecco pro comes fully equipped – including accessories and filter media. You are ready to go! This product comes complete with multi-function handles that make opening, closing, and handling the baskets of media easy. The pump itself comes with a built-in silicone sealing ring to prevent leaks. Also, the rotational shut off taps and ceramic components make this the ideal solution for just about any aquarium set up. It is obviously extremely important to keep your aquarium as clean as possible, not only for the health of your fish, but your family as well. In other words, a super efficient filter running does not mean that you can skimp on cleaning and maintenance. But, with the EHEIM Ecco Pro, you will be able to quickly clean the filter, getting rid of waste without a lot of mass. One feature that this filter has that can be very helpful for cleaning and maintenance is a set of rotational shut off taps. No longer do you need to worry about removing tubes and dealing with water leaking all over the place. Simply rotate the taps, remove the top of the pump, and remove the baskets of media for cleaning. The filter canisters are equipped with practical filter baskets. These can easily be removed and filled according to individual requirements. The number of baskets is determined by the size of the filter: ecco pro 130 = 1 basket, 200 = 2 and 300 = 3 baskets. 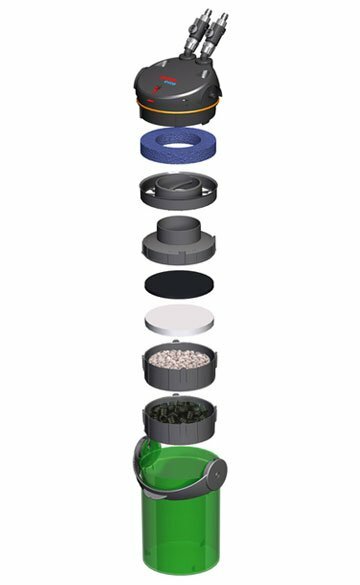 There are numerous benefits that the EHEIM Ecco Pro has to offer, not least of which are the large capacity filtration baskets. Because these are larger than your average canister filter, you should expect to have to clean these less often. Another feature that a lot of owners appreciate is the inclusion of ceramic components throughout this device. These components help to ensure that the pump operates quietly at all times, which can be a big deal if your aquarium is in a bedroom or anywhere else you don’t want to have to hear the sound of an aquarium 24 hours a day. Priming a pump or filter for an aquarium can be an unpleasant experience, as many aquarium owners will tell you. But, this product has a self priming handle that eliminates that problem as well as a pre-filter on the top to ensure that maintenance is easy, too. Suitable for both Freshwater and Saltwater Tanks. Finally, the EHEIM Ecco Pro comes complete with long-term biological media, which is something that you do not always get with affordable canister filters such as this. This media is used to promote healthy bacterial growth, which is essential for clear, clean water and odor control. There are many benefits of canister filters, see more here. According to most of the reviews, this is a very easy filter to set up and maintain, though you should expect at least a small amount of leakage whenever you disconnect the tubing. The only real drawback with the EHEIM Ecco Pro is that the flow rate is not necessarily as high as you might expect from more expensive canister filters. On the other hand, the energy efficiency of this filter – not to mention how quiet it is – means that this slight reduction in flow rate is a small price to pay. Even though this is a fairly popular vertical canister filter, it can be difficult to find in pet stores or aquarium stores. As a result, you will find that the best place to buy this is online, where you can currently save about $20 off the original price, making this filter come in at less than $120. Is This the Best Filter For Your Aquarium? 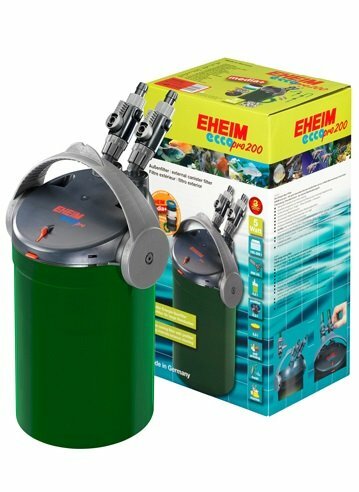 If you have been shopping for an external canister filter for your aquarium and it is 60 gallons or less, then the EHEIM Ecco Pro might be a worthwhile investment for you. Of all the similar products on the market today, this one has a very reliable reputation for performance, energy efficiency, and for being extremely quiet. When you also consider the facts that it is easy to set up, and the large media baskets mean that you will be required to clean it less often, it’s almost hard to not recommend this filter. With a three-year warranty, included media, and a large number of very positive reviews, the EHEIM Ecco Pro might be one of the best choices for first time canister filter purchasers.